Cellars are cold. Typically kept around 55 degrees, the ideal temperature for wine storage is too chilly for most collectors to spend much time sipping or snacking in their cellars. 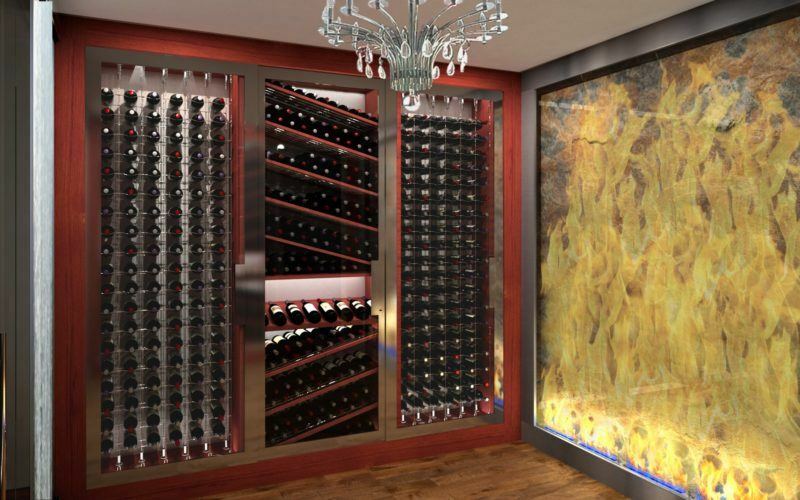 Enter the custom wine lounge. A major cultural shift in wine collecting, entertaining at home, and an overall increase in wine investment has lead to a growing demand for these spaces in luxury homes around the world. Serious collectors are transforming their storage cellars from basic basements into stylish spaces fit for entertaining. Traditional wine cellars exude timeless, classic elegance. Think custom built racking with intricate details in rich woods like Redwood, Oak, and Mahogany. Classic designs often include natural stone or brick fireplaces, oversized leather club chairs, and rolling ladders. Lighting is often soft and muted to give the room a feeling of warmth and comfort. These spaces are a true mark of high-end living and often feature sizable tasting rooms for entertaining in style. Main elements of design: solid woods, brick, leather, natural stone. Clean lines, stainless steel, and frameless glass are the cornerstones of modern wine lounges. Wood tends to be used as an accent rather than a structural material (as in traditional designs). The wine racking itself tends to be metal or acrylic, which creates a sleek, streamlined look. Metal racking generally fits more bottles in less space, which makes it a top choice for narrow areas as well. Acrylic wine racking is made of transparent material, giving it a somewhat unconventional and futuristic feel. The overall look is minimalist, uncluttered, and updated. Main elements of design: metal or acrylic racking, stainless steel, floor to ceiling glass. Also called Urban Industrial, this edgy, masculine style is particularly popular amongst urban wine collectors. Industrial elements with timeworn finishes and distressed details are often used to create a look that is stylish, original, and on trend. Stainless steel cable wine racking is often used to create a sleek, minimal look that compliments this utilitarian aesthetic. Main elements of design: weathered wood, exposed brick, polished concrete, galvanized metal. This high-glamour design style is ideal for opulent, luxurious wine lounges. These rooms often feature lacquer finishes, crystal chandeliers, mirrored surfaces, and bold, contrasting colors to convey a sense of lavish extravagance and showcase expansive collections. Main elements of design: neo-classical lines, rich metallics, ornate details, velvet accents. 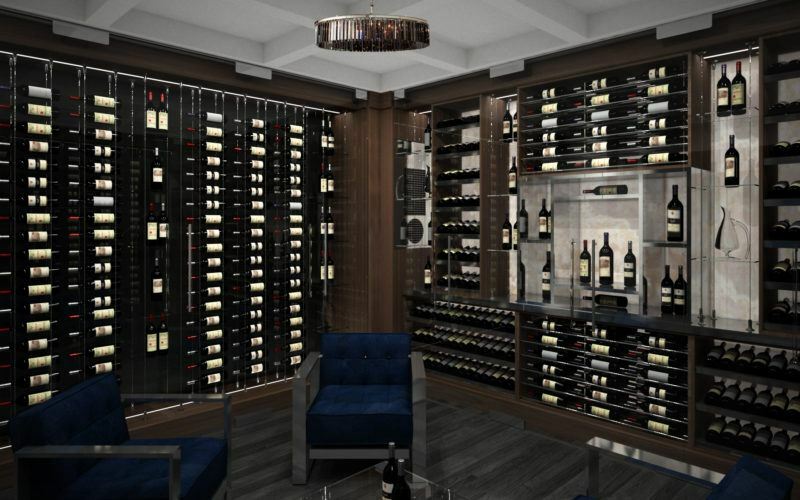 The overall look of a contemporary wine room is comfortable, stylish, and deliberate. Cable racking is frequently used to create the illusion of bottles being suspended in mid-air. This effect is particularly stunning when RGB lighting is used to add artistic style and edginess. Main elements of design: cable racking, accent lighting, frameless glass. Also known as Hamptons style (for the iconic U.S. beachside region), this popular design trend actually extends far inland. Classic coastal wine rooms are defined by relaxation and comfort. Light wood or painted white wood racking is often used to give the space a light, airy feel. Main elements of design: ocean hues, driftwood, reflective surfaces, nautical décor. Elements of traditional style and modern design are combined to create this warm, rugged, inviting aesthetic. Rustic lounge designs often blend wood, metal, glass, and acrylic for a highly original look and feel. Think exposed beams, distressed woodwork, and repurposed wine barrels. Reclaimed vintage finds may also be incorporated to bring a sense of history and add rich character to these high-end wine rooms. Main elements of design: reclaimed barn wood, nature-inspired textures, cork. Mediterranean wine rooms exude wealth and sophistication. Textured walls, curving archways and custom cabinetry draw inspiration from the Italian countryside – the perfect place to showcase a select collection from the Mediterranean coast. Main elements of design: mosaic tile, terracotta accents, wrought iron hardware, vibrant colors. Traditionally featured in mountain chalets and lakeside lodges, chalet style is becoming a popular design choice for wine lounges as well. Think warm woods, fur upholstery, and antler chandeliers. Main elements of design: heavy timbers, animal hides, stone elements. This warm and casual style is perfect for a welcoming wine lounge retreat. Reclaimed woods and vintage decor exude a rustic, old-world charm. Complete the look with a repurposed wine barrel chandelier. Main elements of design: wood beams, repurposed barn doors, carved wood details. 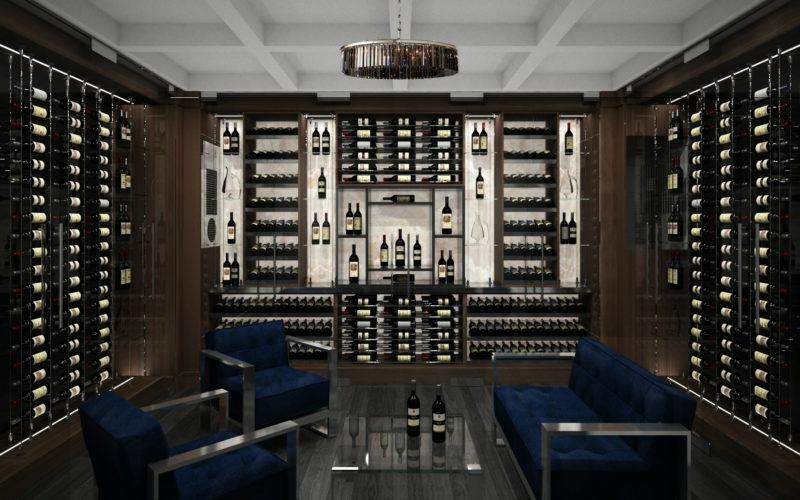 From traditional to industrial chic and French country to coastal, there is no one “in” style when it comes to luxury wine room design. 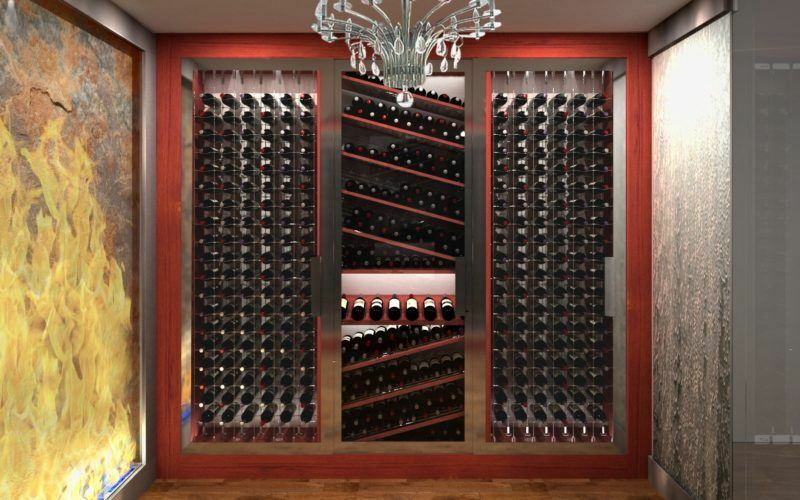 Like the collections they store, custom wine rooms are reflective of the tastes and preferences of the collector. Now your personal collection can be a highly original, featured space in your home – rather than tucked out of sight in a dark basement.